An update appeared on the test server a few days ago, introducing several changes to patch 1.2. One of them is replacing the bot icon, which is to signal to the players that a given wargaming bot is sitting in a given vehicle. Earlier we showed this picture reminiscent of crayfish pliers, now it’s a small, pixel tank. 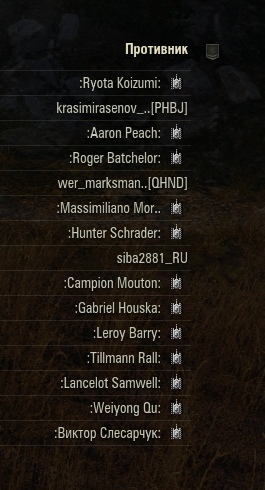 Apparently, the developers found out that excessive use of the phrase “crab”, whom red players on the Russian server are called (the equivalent of our tomato/potato), may not be too favorably received. Cancer? I thought they are using “рак” as in crayfish for the tomatoes. The original red icon even has the claw of a crayfish. Horrific what it have come to…. Forgive my igorence, but why and when does WG place vehicles in a match with a bot in charge? Aha. As the story above says “replace” I thaught that it was something that already was live on the client. But it’s only for US and South America? I hope so. Honestly, I wouldn’t notice I fight bots.